Do you really want to switch ESPs every two years? If not, download this guide...and make a smarter choice. Most businesses stay with an ESP for only two years. Switching ESPs is costly, time-consuming and stressful. Wouldn’t you rather choose an ESP you can stick with for the long term? 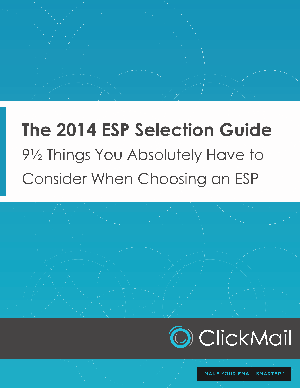 If your answer is “yes,” the 2014 ESP Selection Guide will help that happen. Get--and keep--you focused on your actual requirements, avoiding the distractions of bells and whistles. Save you time by ensuring you don’t add the wrong kinds of ESPs to your short list, but only those that meet your needs. Choose wisely. Choose well. Make the 2014 ESP Selection Guide a key part of your selection process. Simply fill out the form at your right and download your guide today!